As powerful as human love can be, it cannot compare with the unique love Jesus taught and exemplified. In fact, Christ’s love is so specialized the scriptures sometimes employ a different word to distinguish it from the ordinary concept. This word in the English scriptures is Charity. Unlike Charity, “which never faileth”, but “endureth forever” (Moroni 7:45, 47), worldly love is fickle, prone to fall in and out of our hearts depending on circumstances. Like ordinary love, Charity needs to be experienced to be understood. God shares his love with us, and after realizing how deeply he loves us, we might be inspired to reciprocate or even emulate His love. “We love him because he first loved us” (1 John 4:19). Charity does not come naturally to the natural man. Instead it is a gift we receive through prayer. Prayer is a form of work, something we must exercise regularly; this is especially true for the reception and retention of Charity. The scriptures urge us to “pray unto the father with all the energy of heart” to be “filled with this love” (Moroni 7:48). The exercise of this type of prayer can have a cardiovascular effect, which increases the capacity of our hearts to love with more breadth and depth for longer. Receiving Charity trains us in the art of loving first. Although very common, measuring another’s interest in loving us as a condition to loving them is more shallow than the love we are capable of through Christ. Christ “first loved us” and his love pushes us to do the same (1 John 4:19). So before we have enough information about someone to judge whether they merit our time and effort, we can choose to love them first. We don’t have to wrap our minds around someone else’s world until we find common ground in order to love. We can push past loving people just because we can see in them things we understand and love about ourselves to loving them just because. When we pray for Charity, we can include an object, a specific person, for whom we can learn to love first. Sometimes this object we are praying to love should be ourselves. Being “filled with Charity” is not an ability limited to loving others despite their weaknesses, but also ourselves. Sometimes we can learn to appreciate the sordid pasts of others and love them today regardless, but find ourselves loathing our own history so much that we become restlessly uncomfortable in our own skin. Christ’s love comes to us as a comfort, precisely because it comes to us through the “Comforter” (Moroni 8:26). The reception of Charity reminds us that we are not only meant to be the messenger of Christ’s love, but also a receptacle; we are meant to believe the message too. When we read that “[Christ has] loved the world, even unto the laying down of [his] life for the world” (Ether 12:33), the world is not some wholly abstract phrase here, we are the world to him. Spiritual syntax demands that his loving us first not only move us to love him in return, but also love ourselves more completely, which multiplies our ability to love, period. When we believe Christ’s love for us, we naturally want to love like him (see John 13:34). Our role as an appreciative consumer of his love prepares us to become a distributor too as Christ’s Charity drives us to pour out our hearts in love for others; a marvelous work, from which we can grow weary. As we continue our commitment to loving others, we might fear to expend our coveted reservoir of God’s love, a reservoir carved out originally by our fervent prayers and miraculously filled by the Lord. Just like the widow of Zidon, when we faithfully use up our all for others, we will witness how God will not allow our reservoir to fail (see 1 Kings 17:8-16). Prayer, our connection to the power of loving first, will also enable this love to last, because “perfect love…endureth by diligence unto prayer” (Moroni 8:26). It can be overwhelming to realize the implications of an infinite love, but this weighty gift of Charity mercifully comes with a manual. The same Comforter that delivers the package of perfect love to us also is the manual for its correct application. Charity is not a mandate to become a perpetual doormat or an unflinching punching bag. The Spirit “will show unto [us] all things what [we] should do” (2 Nephi 32:5), including what we should do with this most precious gift of His love. The Holy Ghost will prompt us not only to turn the other cheek at times (see Luke 6:29), but also to “[reprove] betimes with sharpness” (D&C 121:43). This repeated spiritual process of seeking Christ’s love and wandering through paths unknown to deliver it, will one day walk us back to Him. In this way, “when he shall appear we shall be like him,” because Charity, above all other gifts, sculpts us most closely into Christ’s image (see Moroni 7:48). After all, Christ’s image needs to be seen on more than paintings and sculptures, it needs to be witnessed in our acts and on our faces as we choose to love first and love last. Special thanks to the editing wizardry of my friend Katherine. When I first began to seriously read scripture, I immediately noticed the magic of its language. Certain words or passages enchanted me “unto the overpowering of [me] to read them” (Ether 12: 24). The elevated language of scripture lends a certain power to the spell of the gospel’s message. It’s abstract phrasing is the perfect medium through which the Spirit can transform mere ink on pages into the living word within our hearts. Thus, the gospel is not only good because it is the story of God, but it is good because it is well-written. Like a spell wrought upon us, it can move us and change us. The modern mind is accustomed to information on demand and fast moving prose, like instant messaging, memes, news articles or novels; therefore, the slow, ponderous poetry in scripture may bore, annoy, and confuse us in the same way that waiting a couple of seconds for a buffering video stream does. Although not always evident and certainly not always appreciated, the precursor for revelation is often confusion. The promise “ask, and ye shall receive” presupposes a question; the person praying wants to know something they currently don’t or to know something to a higher degree of clarity or depth than they currently do (John 16:24). Poetry is the perfect medium for creating blissful bewilderment. The oddities of its language create textual speed bumps that pause our otherwise hurried ascent through a narrative. Our pauses to ponder allow the Spirit to conjure up concepts and images in the swirling potion of our jumbled thoughts. And in this abstract stew created by poetic phrasing, multiple, even contradictory, meanings are possible as we drink deep the “inexhaustible gospel” . The gospel is made inexhaustible by an infinite atonement, but it is often inexhaustibly expressed through the convergence of spirit and poetry. Poetry can magically transport us into the abstract spiritual world of “starkness” , a world full of stark contrasts, where realities are not clothed in language or time. A place where “all things whatsoever God has seen proper to reveal to us” he can “[reveal] to us in the abstract” . Spiritual landscapes turn our world inside out making our understandings susceptible to more epiphany-catalyzing moments. Sometimes seeing something askew can change the way we perceive the world, like Dickens’ epiphany from seeing coffee-room spelt backwards-“mooreeffoc” . In this state, the spirit can deliver our favorite, time-honored passages from an existence of continual triteness into novel applications with the suddenness and force of a lightening bolt. The power of poetry, as it is paired with the Spirit, is not limited to merely transforming our perceptions of the scriptures, so that we can pull out an inexhaustible amount of applicable principles out of thin air. 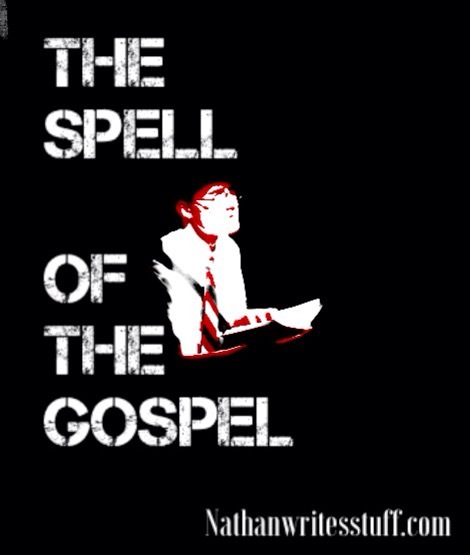 But the gospel’s spell can transform us from the inside out. Our God is a “God of miracles” who “answereth by fire” our scriptural inquiries and our “bosom shall burn” with the truth (Mormon 9:15-16; 1 Kings 18:24; and D&C 9:8). The scriptures are his tool to melt our hearts with poetic tender mercies and shape us into his likeness with repeated baptisms of spiritual fire. We can witness this magical transformation again and again as we seek God through continually studying his words that can be “made flesh” as we live them (see John 1:14). This phrase comes from a devotional address given at Brigham Young University on 18 August 1992 by Elder Neal A. Maxwell published in “The Inexhaustible Gospel”, in The Inexhaustible Gospel: A Retrospective of Twenty-One Firesides and Devotionals Brigham Young University 1974-2004 (Intellectual Reserves, Inc., 2004), 211-225 or click here. This term is defined beautifully by James L. Kugel as “the stark world of the soul” a place of “pitch-darkness and bright, bright light”. A “moonscape” a place “altogether eerie and uncanny”. A world that “is quite overwhelming”. For more on starkness, see Kugel, The God of Old: Inside the Lost World of the Bible (New York, The Free Press, 2003), 66-67, 140-142, 156-158. The Words of Joseph Smith: The contemporary accounts of the Nauvoo discourses of the Prophet Joseph, Andrew F. Ehat and Lyndon W. Cook, ed. (Kindle Edition), 112. J.R.R. Tolkien described the term Mooreeffoc, which is just coffee room spelled backwards, in this manner: “Humility is enough. And there is (especially for the humble) Mooreeffoc, or Chestertonian Fantasy. Mooreeffoc is a fantastic word, but it could be seen written up in every town in this land. It is Coffee-room, viewed from the inside through a glass door, as it was seen by Dickens on a dark London day; and it was used by Chesterton to denote the queerness of things that have become trite, when they are seen suddenly from a new angle.” In “On Fairy-Stories,” in The Monster and the Critics and Other Essays (London: HarperCollins Publishers, 1997) 146. Here is a blog that talks about this word and also uses this quote from Tolkien, http://americanchestertonsociety.blogspot.com/2006/09/mooreeffoc.html. This could be considered part two of a series on the scriptures that began with Scriptural Landscapes, or click here. Sometimes there are metaphorical boulders that fall in our path to peace, other times there are actual boulders that block our way. When we suffer, the question we often ask is why. Why did event X happen? However, in the equation of our own suffering, why is not the variable we are trying to solve. The scriptures teach us why things happen. Nephi taught “[God] doeth not anything save it be for the benefit of the world; for he loveth the world” (2 Nephi 26:24). And the Lord himself revealed that “[His] work and [His] glory” was “to bring to pass the immortality and eternal life of man” (Moses 1:39). Thus the variable, for which we must solve, is how event X manifests God’s love to us or brings about His work and His glory through our experiences. Instructively, the idea for the creation of algebra was not to dishearten future students, but to simplify problems so that we could solve them. The Lord does not give us problems we cannot solve either. Paul taught the Corinthians that “God is faithful, who will not suffer you to be tempted above that ye are able; but will with the temptation also make a way to escape, that ye may be able to bear it” (1 Corinthians 10:13). Nephi was okay with “not know[ing] the meaning of all things” because “[he knew] that [God] loveth his children” (1 Nephi 11:17). Our faith in God can give us hope even amidst trials. This is likely why Nephi could be bound unjustly with cords helplessly watching the ship he built be thrashed around in a storm, and yet surprisingly comment, “I did look unto my God, and I did praise him all the day long; and I did not murmur against the Lord because of mine afflictions” (1 Nephi 18:16). Focusing disproportionately on comprehending what only the Lord can comprehend could be paralyzing instead of catalyzing our faith to action. Although the word faith is more commonly used as a noun, in the grammar of the gospel, it is a verb whose object is God. Our faith in God inspires us to not only “hope for a better world” (Ether 12:4), but propels us to make this world better-one faithful act at a time. Sadly, sometimes our understanding of gospel grammar might allow a trust in faith’s object if only the subject were different. We may think, “sure ‘all things are possible to him that believeth’ (Mark 9:23), because the “him” in this scriptural sentence surely means someone else’. Mathematically speaking; however, the scriptures can say all things are possible to you and I, because no matter how small we think our all is, anything multiplied by an “infinite atonement” would equal infinity (see Alma 34:8-12). Through the enabling atonement of Christ we can all “come off conqueror[s]” (D&C 10:5) against our trials, if we believe. Photo provided by my friend Brandon. This article is under consideration by the Ensign for future publication. 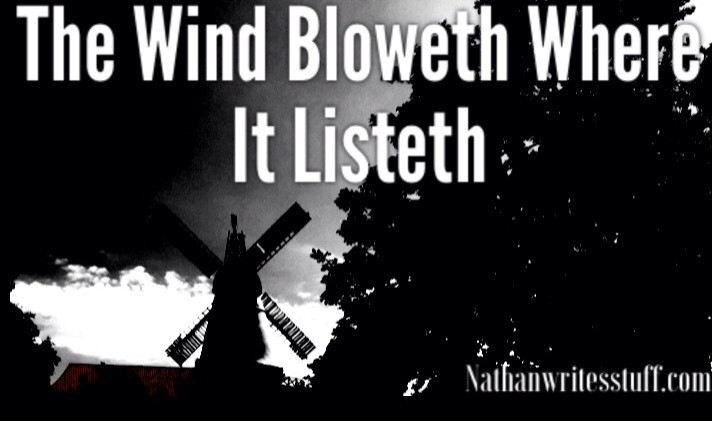 The wind bloweth where it listeth, and thou hearest the sound thereof, but canst not tell whence it cometh, and whither it goeth; so is every one that is born of the Spirit (John 3: 8). Here Jesus imaginatively employed the mysterious movement of the wind to elucidate the apparent elusiveness of the spirit. While we struggle to understand the Spirit’s movements—i.e., “whence it cometh, and whither it goeth”, the Spirit knows where it comes from and where it goes. Thus, ideally, we can trust the Spirit and exchange our desired destination for His. But realistically, man is not always willing to part with his willfulness. The “natural man” is, after all, the natural “enemy of God”. He does not “yield to the enticings of the Holy Spirit” (Mosiah 3: 19), but goes astray pursuing what he thinks is “his own way” (Isaiah 53: 6). And “his own way” it may be, at least in the beginning. But every step he takes away from the strait and narrow, is a step off the refuge of the rock of the gospel, and soon he will know what it means to be exposed to the forces of nature. For Satan’s storm will come with its “harrow[ing]…whirlwinds” and he shall “be driven with fierce winds whithersoever the enemy listeth to carry them” (Alma 26: 6). The natural man left to himself is just a natural disaster waiting to happen. Man’s stripping off the armor of God for more unrestrictive movement, in the end just becomes a uniform change. Of course, the armor Satan provides is the type of chain mail that does not protect, but instead connects you to his misery, which is described as awful. And being bitter from sipping the bitter cup, the natural man wants nothing more than “to kick against the pricks, to persecute the saints, and to fight against God” (D&C 121:38). The natural man does not become an enemy of God, just because he does not yield to the spirit, but because he yields to the quintessential enemy of God, “that awful monster the devil” (2 Nephi 9:19). Sadly, Satan’s hold on man is so widespread, that this enmity with God is considered natural. Satan, the father of lies, is the world’s greatest salesman and advertiser. Who else could take fire and brimstone and package it as prime real estate? He is not only persuasive, but pervasive to the extent that there are few places you can go to escape his noisy sales pitches and eye-catching advertisements. Truly, with the enemy combined there are loud voices everywhere saying; “lo here or lo there”. Amidst this rowdy ruckus how are we ever to hear the still small voice? We must often leave the world and go “into the wilderness to be with God” (Matt. 4: 1, Joseph Smith Translation). Sometimes this wilderness is no further than a finger movement to turn off some type of electronic device and sit in silence. We may be surprised at the many things that only silence can say. Then again there are many who after expending much effort towards contacting the spirit are left baffled at the spirit’s elusiveness. Even so, let us not confuse elusiveness with aloofness. For God is very concerned about us to the extent that he has “the very hairs of [our] head[s] numbered” (Matt. 10: 30). I think that sometimes we confuse the promise of “always hav[ing] his spirit to be with [us]” (Moroni 4: 3) with the Spirit always waiting upon us or with the Spirit always speaking to us. We cannot expect the spirit to answer at our beck and call, for it is us that must always be willing to be “led by the spirit, not knowing beforehand the things which [we] should do” (1 Nephi 4: 6). And perhaps we are meant to be baffled and to feel lost at times, but this does not mean the spirit is not with us. Perhaps, we are just having a Spirit-supervised moment where we are meant to understand that “man doth not comprehend all the things, which the Lord can comprehend” (Mosiah 4: 9), and must wait for his arm to be revealed (see D&C 123: 17). Although we should not expect constant revelation, we are expected to be constantly ready for revelation, so that when it comes we are in a position to receive it. This requires us to be worthy. We all know that “the Spirit of the Lord doth not dwell in unholy temples” (Helaman 4: 24). So if we have been wounded by sin, we must seek out the savior to be made whole again. The flaws or missing pieces in the armor of God that allow Satan’s fiery darts to pierce us are not existent in their original design, but occur due to our lack of maintenance or misusage. Continual repentance is a big part of maintaining our armor’s integrity. This way we can heal the wounds from past sins as well as mend the chinks in our armor, so we will not succumb to the same temptations in the future. A suit of armor that is whole is required to keep our souls holy. Although everyone has the ability to feel the spirit, not many people develop this ability into a highly trained skill, and thus become highly sensitive to the Spirit. In fact, two of our best training exercises, scripture study and prayer are often under utilized both in frequency and in intensity. These exercises require us to regularly reach past our past spiritual plateaus to new peaks of spiritual awareness. This is true particularly of prayer. Sometimes prayer can seem like a hit or miss phenomena. If we feel something is lacking, we should work on our prayer. We need to realize that “prayer is a form of work” (Bible Dictionary, 753), it is not supposed to be done effortlessly and by rote. Furthermore, we sometimes forget the purpose of using Christ’s name in prayer. According to the Bible Dictionary, “We pray in Christ’s name when our mind is the mind of Christ, and our wishes the wishes of Christ…we then ask for things it is possible for God to grant” (Bible Dictionary, 753). Prayer is not primarily a dialogue where we offer our list of wants and wait to hear if they are accepted. It is however a spiritually submissive activity from the start, where we seek the will of the Lord well before we rattle on about this blessing or that blessing. In prayer the “Spirit also helpeth our infirmities: for we know not what we should pray for as we ought: but the Spirit itself maketh intercession for us with groanings which cannot be uttered” (Romans 8: 26). According to Doctrine and Covenants 50, when we are holy, “[we] shall ask whatsoever [we] will in the name of Jesus and it shall be done. But know this, it shall be given you what you shall ask” (D&C 50: 29-30). Accordingly, our prayers are major opportunities to recognize and follow the Spirit. But desire or will, in the end, is much more important than technique or ability. That is why the natural man falls short; he is unwilling to surrender his will to the father, because he sees it as a defeat, and it is—the defeat of the natural man that makes possible the birth of a spiritual man or woman. This defeat or surrender should happen in our prayers. Consequently, the purpose of mentioning phrases like “thy will be done, in earth as it is in heaven” (Matt 5: 10) is for us. God’s will will be done whether we pray for it or not. But our praying for His will to be done, establishes an atmosphere during our prayer that makes it possible for us to know His will and be a part of it being done. Our prayers should be less about us telling God about our will, and more about us searching for His will and submitting ours to His. A lightly edited excerpt of a Sacrament meeting talk originally delivered in 2010.